drawnow slower in 2014b ? I want to visualize data from a swarming simulation. For this sake, I generate textured surface objects, rotate and place them according to the data from the simulation. I also do an animation, where I manipulate the XData and YData properties of the surface objects and update the figure with drawnow. This all works fine. 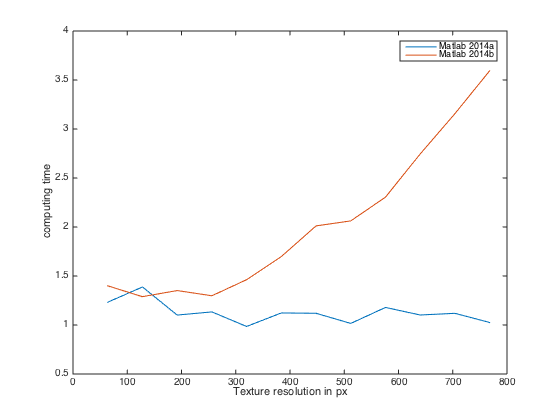 The problem is the following: The same code runs much faster with the older 2014a version of Matlab. Profiling the code, I realized that much more time is spent for drawnow in 2014b. The speed is relevant to me, since I want to do a real-time application. I have also tried this on a Windows machine (Intel Core i7 860, 2.8 GHz) and observed the same behaviour. If you have read this far, thanks :-) I'm looking forward to your suggestions. I am seeing the same issue. I'm using a function I found at matlab central (inputsdlg). It takes about 1 second on 2014a, and 20s (yes, twenty) on 2014b. The profiler says all the time is in drawnow. right before drawnow inside inputsdlg (matlab central). 2014b is now just as fast as 2014a. This turns off OpenGL rendering of course, so it may not be of any help in other cases. Painters wouldn't be a good choice here because they're using AlphaData. Before R2014b, painters didn't support AlphaData. Trey, when the profiler points at drawnow, it's just telling you that the bottleneck is synching up multiple threads, it doesn't tell you anything about why. It's very unlikely that the inputsdlg issue is the same as this one. I don't know anything about inputsdlg, but it doesn't look like it's doing anything with graphics, so moving things into the graphics card's memory is unlikely to be a factor. Have you contacted MathWorks Support? What's going on here is that in R2014b, the geometry is stored in the GPU's memory. Because you're modifying the XData & YData on each frame, it has to get pushed across from MATLAB's arrays in the CPU's memory to the GPU's memory. This is can be a slow operation. This approach yields a small gain in R2014a, but a very large gain in R2014b.